Who writes and tweets and podcasts and draws and blogs? Katie Davis does! Katie Davis has written and/or illustrated nine books for children including one middle grade novel, The Curse of Addy McMahon. Her first picture book Who Hops?, published in 1998, "grew out of a silly but sanity-saving car game she devised while stuck in traffic with her children." Most recently she illustrated Little Chicken's Big Day, written by her husband Jerry Davis. In Twitter-land, Katie Davis (@katiedavisburps) caters to over 1,800 followers by distributing news about children's literature, retweeting articles to assist writers, and sharing thoughts about being a children's author and illustrator. She has opened herself up to a community of people who love to read, write, and recommend books to children. In a recent podcast she said, "I love how people can really help out each other's businesses through the internet and though social media. It's all about reciprocity. The more you help somebody, the more you can be helped." (Episode #73, Eeek! eBooks! Chapter Two). Her podcast, Brain Burps About Books, where she talks about "everything to do with children's literature" is available on her website, iTunes, or via her app of the same name. She has published over 70 episodes packed full of helpful information. One of her latest podcasts, Episode #75 "Best Books of 2011", she hosted two school librarians, Travis Jonker (@100scopenotes) and John Schumacher (@Mrschureads). Jonker and Schumacher shared their views on their favorite children's books of the past year. It was entertaining to listen to and made my cooking adventures in the kitchen this morning much more pleasant. When she was asked about her a podcast in an interview on The Happy Accident she said, "I love doing it. I love talking books, or the book business with colleagues. I love that there are a bazillion subjects I could cover and still have more to talk about. I love promoting other people and helping my listeners with their careers." Katie Davis has illustrated all of the books that she has written. In a Patricia Newman article, I learned that she uses numerous different mediums for her illustrations. Who Hops? and Who Hoots? were painted with acrylics. Mabel the Tooth Fairy and How She Got Her Job and Little Chicken's Big Day were illustrated with pencil sketches and Photoshop. Kindergarten Rocks, appropriately used crayon colored sketches and Photoshop. In addition to illustrating, writing and podcasting, Katie also writes a regular blog. Her blog is available on her website. She includes links to all of her podcasts and then shares other children's literature related material. Recently she shared a few posts about, Picture Book Month, which she was a co-founder. There is so much good information on her blog. I found myself just scrolling through all the fun posts. My family has had a love affair with her first book, Who Hops? since my 6 year old daughter was very little. The book is just plain fun fun! I joked with Katie over email that I have read it to my children collectively over 800 times. I asked my daughter how many times we read it together and she said, "I think, like a million!" The book begins with a simple question, Who hops?, and then three animals are shown that are able to hop and then a cow -- which of course can't hop. Our favorite part is on the next page when we shout "NO, THEY DON'T!" 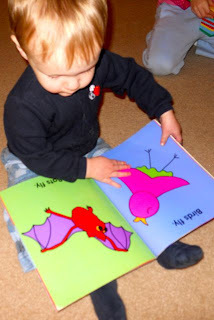 The book follows this pattern for other actions like flies, slithers, swims, and crawls. My youngest son, 18 months old, is currently obsessed with the book. I thought we needed to include him in celebrating Katie's birthday. We started the celebration by reading Who Hops? and then watched the YouTube video at the end of this post of Katie Davis reading Who Hops? This prepared my youngest son for the game he was about to play with his family. To play our game, we then laid out four animal tiles that matched animals from the book -- a frog, a kangaroo, a bird, and a snake. 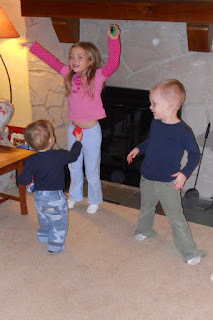 My daughter started hopping, my son was flying, and I was slithering (Look for a picture of me slithering below). My wife told our son to give the animal tile to the person that was like his animal. We had foam tiles of many of the animals in the book. To play this game at your house you could draw the animals or download and print photos from Google Images. Here my daughter was hopping with the frog tile that my son had given her. Then, he tried to give her the bird tile too! Whoops! He was so excited to play this game. 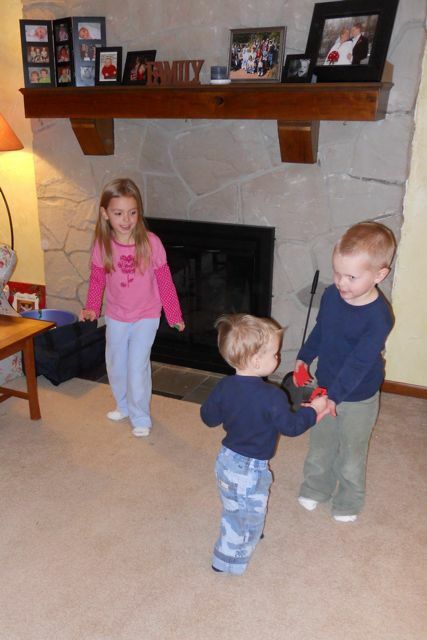 Here he hands a kangaroo to my son who was flying. Oh well! 1 out of three isn't bad! He would be in the baseball hall of fame with that average! After the game, he tried to brush up on the animals for next time! I was surprised that my other two children wanted to play the game too as "the pickers" who picked the animals from the pile of choices. They enjoyed handing out the animals plus hopping, flying, crawling, slithering, and swimming was pretty fun too! The best birthday I every had is today's, because I get blog-celebrated which is incredibly cool! But, I do have a couple of older birthday memories...if you look at my lower lip, you'll see the scar I got on my second birthday when I fell and hit my face on my "bopple," what I called my baby bottle. That is my first memory, followed by my second when I turned 10, and got very excited to be a whole decade old. Sixteen was cool, because I had these awesome dark green velvet pants that I felt made me very sophisticated, and then there was my 21st birthday. My dad took me to the very special 21 club in New York City, where he purchased and stored a bottle of wine from the year of my birth. With great ceremony, we opened it, toasted, and sipped. I thought it was disgusting! I should've stuck with the velvet pants for sophistication. I've had a lot of fantastic birthdays, a very few bad ones (a flat tire on my way to my own 24th birthday party, every guest canceling over the course of the day, so no 27th birthday party, and did that 24 hour flu really have to pick the 24 hours over my 40th birthday?!) but this is the first that I've been blog-celebrated, so I thank you, for giving this to me! I love it! Katie, thank you for the birthday thoughts. We hope you have a FANTASTIC birthday! Now I really want a pair of green velvet pants. Great post, and Happy Birthday to Katie! What a great birthday celebration and I love the photos! I hope 2012 is your best year yet, Katie! I think green velvet may comeback in style very soon. And when they do -- we can thank Katie Davis! Oh, wow. This comment challenge introduces me to yet another brilliant blog. Great stuff! Eric - I've been seeing your posts on 12X12 and maybe Children's Book Hub or PiBoIdMo on FB, and now I'm here from the Mother Reader Comment Challenge too! What a great idea you have here - really fun! I'm not famous, but I am an author. Let me know if you need any more April birthdays to celebrate :) Looking forward to checking in with your posts! Happy (belated) Birthday, Katie! This is such a fun blog, I just learned that my b-day is the day before Dr. Seuss! I found your blog through the Great Comment Challenge. I am so glad I did! What a fun post! 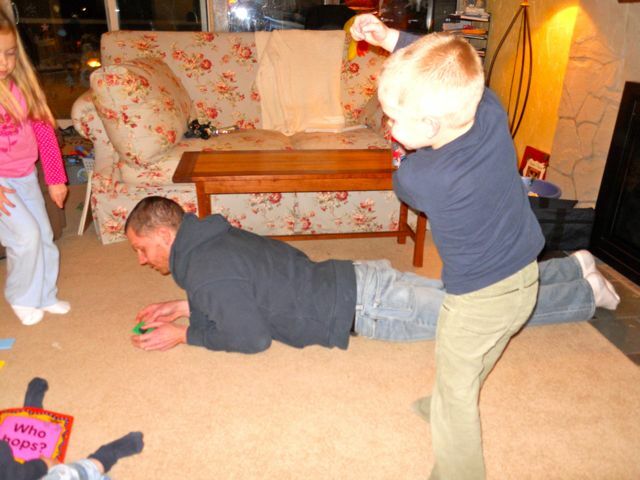 I love the activities with your children. What a great way to celebrate a favorite book illustrator/author's birthday! Hi Eric, The Great Comment Challenge is working! A very nice gift you give to all. Just found your site through the comment challenge. Great concept, I look forward to reading your posts! I love your Brain Burps podcast. Wow! So, excited to have everyone stop by to wish Katie Davis "Happy Birthday"! Thanks so much! Eric, I truly love the 'extensions' that you create so that your family can celebrate each author's birthday and books in a different way. My b-day is on January 4 too. Reading Katie's memories was fun because I can totally relate to weather related cancellations. This year it was 40 degrees on my birthday- I'm pretty sure that has never happened to me. @ Carrie - Happy Belated Birthday. I have heard from a few people this week that share a birthday with Katie Davis. So cool -- that is what it is all about! 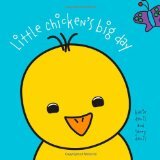 We enjoyed Little Chicken's Big Day a lot! What a fabulous angle for a KidLit blog! Every post's a party--such fun! First of all, what a great site! Second, I enjoyed learning more about Katie Davis and loved watching her read her book. I'm just starting out as a children's author and find this enjoyable and inspirational.